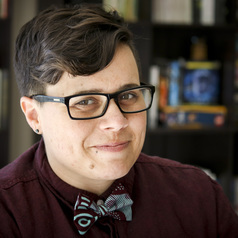 Nyx McLean is an academic and researcher specialising in gender, sexuality, digital counter/publics and communities. Nyx holds a PhD from (UCKA) Rhodes University, their thesis was a post-structuralist anti-racist queer feminist study that interrogated Joburg Pride in the context of post-apartheid South Africa. They lecture in postgraduate studies at the Cape Peninsula University of Technology where they are also involved in curriculum development. Nyx has conducted research, presented and published papers nationally and internationally on the significance of the internet and digital environments for enabling change with a specific focus on marginalised queer identities. They have held the position of board member at Gender DynamiX, Africa’s first transgender organisation.